Drama. The Cameco Corporation mines uranium ore in the rocks and swamps of northern Saskatchewan, Canada, and is said to have produced about 20% of all the uranium that has ever been produced, and still holds about 10% of the world’s reserves, but less than Australia (30%) and Kazakhstan (12%). However, uranium is not a scarce resource and currently retails for about $50 a pound and a viable mine can produce it for about $20 a pound, which is comparable to many kinds of cheese. Were it not for risk price (we are buying and holding the stock only if the Red Line Stock Price (SP) is above the Black Line Risk Price (SF), and for no other reason; please see Exhibit 1 and 2 below), we wouldn’t know how to invest in these companies (Reuters, May 1, 2013, Cameco profit plunges 93 percent on weaker uranium sales); for example, the extraordinary plunge in Cameco’s profit did not affect the stock price by more than minus (2%) today and the volume of trading was about 1 million shares which is comparable to every day. On the other hand, the earthquake and tsunami that struck Japan in March 2011 and crippled the Fukushima atomic power plant, and the aftermath of Chernobyl and many other nuclear accidents of varying severity outside of engineering expectations, has caused many countries to reduce their dependence on nuclear power despite a desperate energy gap – and the market response to the Fukushima disaster was immediate, and appears to have been a “tipping” point with lasting consequences. Cameco Corporation is engaged in the exploration and development, mining, refining, conversion and fabrication of uranium for sale for generating electricity in nuclear power reactors. 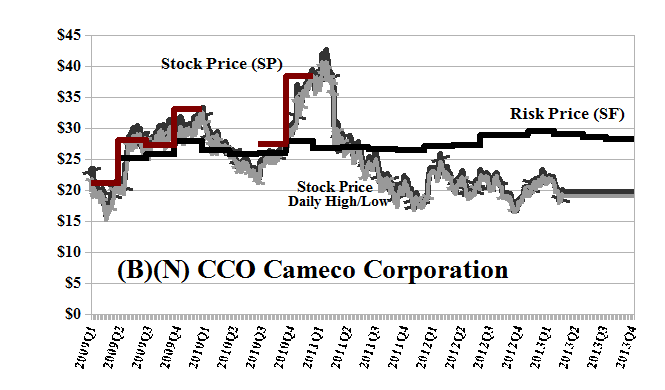 Some investors were still buying Cameco at $40 in early 2011, vigorously up from $25 less than six months previous, and absent a stop/loss or “collar”, were still holding it at $25 again a month later. The Risk Price (SF) is our best estimate of the “price of risk” for the stock and is well-formed, or defined, by a Nash Equilibrium obtained between “risk seeking” investors and “risk averse” investors (please our description of it in the recent Post, Bystanders & Collateral Damage, April 2013). 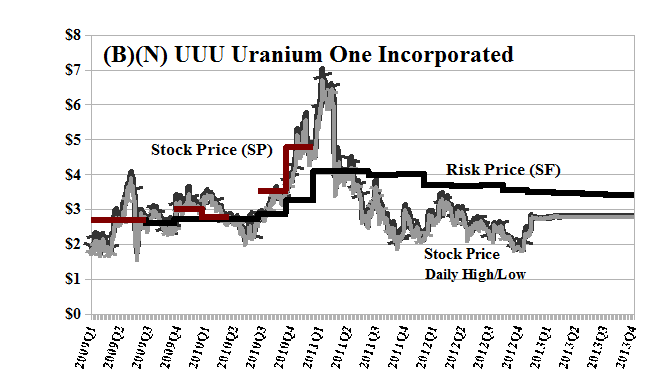 Uranium One Incorporated is a Canadian-based company and is one of the world’s largest publicly traded uranium producers. The Company has a globally diversified portfolio of assets located in Kazakhstan, the United States, and Australia and is operator of the Mkuju River Project in Tanzania. Uranium One’s major shareholder (51%), JSC Atomredmetzoloto (ARMZ), is a wholly owned subsidiary of Rosatom, the Russian State Corporation for Nuclear Energy, and it recently acquired the rest of Uranium One for $2.86 a share or $1.3 billion (CNW, January 14, 2013, Uranium One Enters into Definitive Agreement with ARMZ for Going Private Transaction for CDN$2.86 per Share in Cash).